Repudo is a service that allows you to place a gift for another person at a specific location, with that person having to travel to the location to access it, now the Dutch startup behind it is building awareness with a promotion related to a certain phone released later this week. Repudo’s app is available for iOS, Android and BlackBerry, allowing you to leave a gift in the form of a piece of text, a photograph, a video or an audio recording at a specific location. This can then be sent to anyone in your address book, who then has to visit that location to find out what you sent. Alternatively you can make it public for anyone who finds it to collect. Each ‘item’ is a one off and can’t be collected by multiple people. It’s incredibly well presented and the Android app (which I tested) is one of most stylish Android apps I’ve ever used. Repudo says that it has now worked out how to place other content, specifically apps from the Apple App Store, at locations. So, to tie in with the launch of the iPhone 4S on Friday they’re placing free apps (which normally cost 99 cents) at Apple Stores around the globe. The startup is staying tight-lipped about exactly what apps are up for grabs, but its pitching this as something fun to do if you’re queuing up for a new phone on Friday. 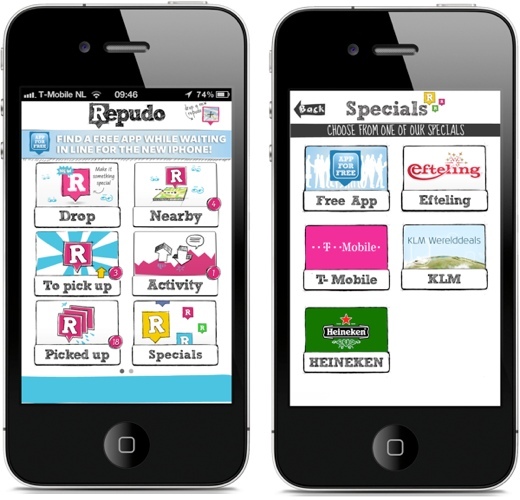 Launched in February this year, Repudo says that it gained more than 100.000 users in its native Netherlands, while it’s partnered with brands such as Heineken, T-Mobile, EMI and Sony Music. As we’ve previously noted, scavenger hunts can be a useful marketing tool as well as fun for users. Among its plans for the future is a Windows Phone 7 app, which is expected to launch soon. Repudo’s offering is certainly one with potential, especially since Gowalla could have taken a similar approach with its (now ditched) items feature. If you fancy giving it a go, this week is as good a time as any, especially if you happen to be close to an Apple Store. Read next: Who Owns the Internet?